As you can probably tell by the number of posts I've published about the game in the last week or two, I'm a bit obsessed with Hot Shots Tennis: Get a Grip at the moment. I'd be lying if I said that surprised me; after all, I've always loved a good tennis title. 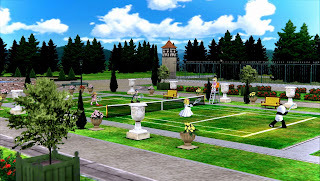 Of course, most, if not all, of the tennis games I've loved over the years--such as Final Match Tennis for the PC Engine, Super Tennis for the SNES and Virtua Tennis for the Dreamcast--have been fairly straightforward approximations of the sport. One of the few exceptions to that rule: Nintendo's Mario Tennis titles, which tend to eschew both tradition and seriousness in favor of good old-fashioned fun. 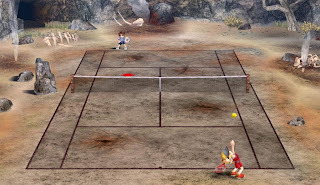 Although I'd definitely call the fun that can be had in Hot Shots Tennis: Get a Grip "good," I wouldn't call it "old-fashioned"--as I'm sure you'll see after you read the following list of four things I love about this crazy, Clap Hanz-developed title. 1. Crazy costumes--I mentioned in a previous post about Hot Shots Tennis: Get a Grip that I wore some sort of Elizabethan or Victorian gown during a recent match. Well, that crazy "costume" is just the tip of the iceberg in this wackadoodle game. Other head-scratching outfits currently taking up space in my characters' lockers include a grass skirt, a kimono, a panda suit (barely visible in the screenshot above) and a tutu. 2. An even crazier cast of opponents--I seem to be about half-way through the game at this point, and already I've competed against a chef, a cheerleader, a farmer, a Helghast (from the Killzone series), an "island dancer," a maid, a movie star, a ninja, a sumo wrestler and a surfer. 3. Loonier-than-the-Looney-Tunes story--Really, it's like a modern counterpart to the silly, strange story that supports the TurboGrafx-16 "classic," World Court Tennis. The goal in that much-maligned (although not by me) game: To bring peace to a place called Tennis Kingdom. The goal in Hot Shots Tennis: To bring the joy of tennis to, among other folks, the aforementioned cheerleader and movie star. 4. Wide variety of wacky settings--Most tennis titles give you a choice of three or four courts--clay, grass, hard (cement) and, sometimes, indoor--and that's it. Boring! All of them can be found in Hot Shots Tennis: Get a Grip, of course, but the crazy locales that surround those courts--including a mountaintop dojo, a TV studio set and a wooden pier--help separate this game from its yawn-inducing competitors. I haven't experienced Hot Shots Golf yet, Simon, but I'll definitely be doing so soon thanks to this game. It's so fun to play and controls so well that I'd play any game this company (Clap Hanz) has created or will create, to be honest. Oh, that's good to hear, Simon. I'll definitely be picking up the PS2 version sooner rather than later. You've played the PSP versions of one or both of the Everybody's Golf/Hot Shots Golf games, right? That sounds super-cool. I love a game that doesn't take itself too seriously. I love Mario Golf AND Mario Tennis. I think I might have to pick this one up if there's a PS2 version. OH, BTW, it's available new on Amazon for PS2 for $5.49. Done! Ah, yes, I knew the PS2 version was cheap! That's even less than I paid for the PSP version. Mind you, I'm not sure the PSP and PS2 versions are exactly the same. For instance, the PS2 version may not have the wacky story mode that's at the heart of the PSP version. I would guess the great gameplay is the same, though. Anyway, let me know what you think about it after you've had a chance to play it, OK? Another person who enjoys FMT! How rare we are indeed. If only I shared the same enthusiasm for spreading the joy of FMT as Troy and Emily do for tennis in HST:GAG lol. I've tried my fair share of tennis games like yourself, and I'd definitely say FMT is the best overall tennis game experience that I've played. Can't say I've played (or even heard of, lol) Aim for the Ace, which system is it for? I'll check it out. I like Super Tennis too (lots of nostalgia, its the tennis game my friends and I played way back in high school when we weren't on the court ourselves :p) but it doesn't feel like its aged as well as FMT (part of why I like it so much I guess, since its like 20 years old!). Part of why I like FMT more than ST is probably because it features real players (best lineup ever imo! although I don't quite understand why Sampras wasn't included, while Agassi was). 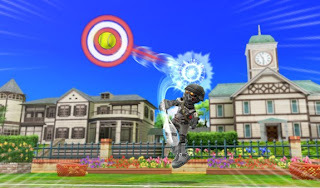 Other big reason which is part of why ST was good too, was that the players were individually unique when it comes to varying shot physics (how different players hit harder/softer and with varying levels of topspin). I think these reasons are why I like Get a Grip so much too, the only thing it lets me down on is lack of AI difficulty, oh well. As for comparing Super Tennis and FMT -- I don't know, I have a hard time saying one is definitely better than the other, to tell you the truth. I agree with you about FMT's strong suits, esp. the differing shot physics. I just wish FMT had female players (I know, the CD-only Human Sports Club offers that option) and offered more tournaments, like Super Tennis. Anyway, I agree with you that Get a Grip shares some positive similarities w/ FMT. That said, I, too, wish the computer was a bit tougher. I rarely lose matches, and even then it's usually because the computer chooses to drop shot/lob over and over and over -- something that I rarely remember happening in FMT. I guess at this point I take for granted how long I've done this, but try changing your settings before matches in GAG to "Use x button only" and you won't have to play silly (easy, and boring) drop shot wars with the AI :D It ups the challenge a little, and makes for longer points, but in the end still isn't that tough. Interesting info about the japanese version of ST too, definitely did not know that! Hello again :) Actually, Magic Engine only plays PC Engine and TG-16 games, as far as I know. You'd need ZSNES or Snes9x to play Aim for the Ace! It's well worth checking out, though, if you're really into tennis games. As for your GAG advice -- thank you! I didn't realize you could do that :) I wish you didn't have to, though, as I like using slice now and then to change things up. Oh well! Also, I didn't know about the debug code for FMT -- or at least I don't think I knew about it! I'll go search for info on it, as I'd love to make the game even harder. I always use the debug code to make Super Tennis harder, as that gave is far too easy as is, too. Ohhhh, you're in for a treat then with FMT and the debug code. I guess I read your post too quickly, didn't catch Aim for the Ace being Super Famicom, should make it easier to find though (hopefully) since PCE/TG16 roms seem harder to come by than SNES/SF. Let me know what you think of Aim for the Ace!, will you? Also, there's an English translation patch available for the game, in case you're interested.